Good news and bad news for Glasgow, but this result may also offer some good news for Edinburgh, at least in the short term. First the Glasgow good news. They will get another chance at home to Connacht on Friday evening to seal their place at the top of Conference A with the resulting home semi-final in the play-offs. The bad news? The Scarlets are likely to be the opponents then and they were much better in this match, particularly in the front row and at half-back. This victory also went a long way toward sealing second place in Conference B for the Scarlets, so now the good news for Edinburgh: the defending champions are likely to rest players for their game at BT Murrayfield on Saturday with a European Champions Cup semi-final in Leinster the following week. “We’re six points clear of Edinburgh with two games to go. We need to win one of them, it is as simple as that,” said Scarlets coach Wayne Pivac. 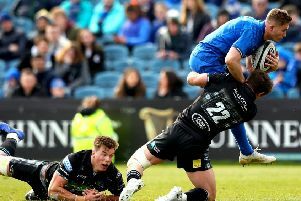 Glasgow’s challenge will be to show they have more ammunition to fire at the big teams of the Pro14 after their scrum gave away a string of penalties and their half-backs were unable to make much of the possession they did get. This was a game in which they could have been competitive but for those two areas. Stand-off Finn Russell was taken off at half-time in a tactical change, while scrum-half Ali Price gifted opposite number Gareth Davies an interception try, just as he did in the Six Nations. Glasgow coach Dave Rennie has confidence in his scrum, while admitting they have a few areas to work on, but it was also a regular Achilles heel in Parc y Scarlets. There was a rib injury to captain Ryan Wilson and ankle injury to replacement prop Oliver Kebble to add to the Glasgow list of concerns. Back-rower Callum Gibbins, pictured, took over the captaincy after Wilson’s departure and he admitted their look back at the Scarlets game will be tough. “It’s going to be a harsh review,” he said. “We need to look at ourselves, what we did in the week and where we can be better. There are areas we need to address and hopefully we can improve those in time for next week. After that performance, our next game needs to be a win. “We have six days to turn it around and address the mistakes we made. Only the oddest of permutations would see anything other than a Scarlets v Cheetahs play-off for the right to face Glasgow and most would expect the Welsh team to progress to Scotstoun. A return to home territory will be crucial if Glasgow are to ensure top place this Friday and then turn things round in the semi-final. “Scotstoun is great, it’s awesome to play there and we get a lot of support,” said Gibbins, who gathered the players together in a huddle at the end of the Scarlets game. “We just talked about our preparation and it was pretty evident in our warm-up that we were off in that area. It’s a bit of a reality check of where we need to be if we’re playing the best teams. Glasgow were tormented by Scarlets half-backs Rhys Patchell and Davies, just as Scotland were in Cardiff in the Six Nations. The pair shared the three tries, while Glasgow’s only try was also a half-back combination, replacement Peter Horne making the score for fellow sub Henry Pyrgos. Plenty to ponder, all the same.